Plant tissue culture is a collection of techniques used to maintain or grow plant cells, tissues or organs under sterile conditions on a nutrient culture medium of known composition. Plant tissue culture is widely used to produce clones of a plant in a method known as micropropagation. Different techniques in plant tissue culture may offer certain advantages over traditional methods of propagation, including: The production of exact copies of plants that produce particularly good flowers, fruits, or have other desirable traits. To quickly produce mature plants. The production of multiples of plants in the absence of seeds or necessary pollinators to produce seeds. The regeneration of whole plants from plant cells that have been genetically modified. The production of plants in sterile containers that allows them to be moved with greatly reduced chances of transmitting diseases, pests, and pathogens. The production of plants from seeds that otherwise have very low chances of germinating and growing, i.e. : orchids and Nepenthes. To clean particular plants of viral and other infections and to quickly multiply these plants as 'cleaned stock' for horticulture and agriculture. Plant tissue culture relies on the fact that many plant cells have the ability to regenerate a whole plant (totipotency). Single cells, plant cells without cell walls (protoplasts), pieces of leaves, stems or roots can often be used to generate a new plant on culture media given the required nutrients and plant hormones. Modern plant tissue culture is performed under aseptic conditions under HEPA filtered air provided by a laminar flow cabinet. Living plant materials from the environment are naturally contaminated on their surfaces (and sometimes interiors) with microorganisms, so surface sterilization of starting material (explants) in chemical solutions (usually alcohol and sodium or calcium hypochlorite) is required. Explants are then usually placed on the surface of a solid culture medium, but are sometimes placed directly into a liquid medium, particularly when cell suspension cultures are desired. Solid and liquid media are generally composed of inorganic salts plus a few organic nutrients, vitamins and plant hormones. Solid media are prepared from liquid media with the addition of a gelling agent, usually purified agar. The composition of the medium, particularly the plant hormones and the nitrogen source (nitrate versus ammonium salts or amino acids) have profound effects on the morphology of the tissues that grow from the initial explant. For example, an excess of auxin will often result in a proliferation of roots, while an excess of cytokinin may yield shoots. A balance of both auxin and cytokinin will often produce an unorganised growth of cells, or callus, but the morphology of the outgrowth will depend on the plant species as well as the medium composition. As cultures grow, pieces are typically sliced off and transferred to new media (subcultured) to allow for growth or to alter the morphology of the culture. The skill and experience of the tissue culturist are important in judging which pieces to culture and which to discard. As shoots emerge from a culture, they may be sliced off and rooted with auxin to produce plantlets which, when mature, can be transferred to potting soil for further growth in the greenhouse as normal plants. The specific differences in the regeneration potential of different organs and explants have various explanations. The significant factors include differences in the stage of the cells in the cell cycle, the availability of or ability to transport endogenous growth regulators, and the metabolic capabilities of the cells. The most commonly used tissue explants are the meristematic ends of the plants like the stem tip, auxiliary bud tip and root tip. These tissues have high rates of cell division and either concentrate or produce required growth regulating substances including auxins and cytokinins. Shoot regeneration efficiency in tissue culture is usually a quantitative trait that often varies between plant species and within a plant species among subspecies, varieties, cultivars, or ecotypes. Therefore, tissue culture regeneration can become complicated especially when many regeneration procedures have to be developed for different genotypes within the same species. The propagation of shoots or nodal segments is usually performed in four stages for mass production of plantlets through in vitro vegetative multiplication but organogenesis is a common method of micropropagation that involves tissue regeneration of adventitious organs or axillary buds directly or indirectly from the explants. Non-zygotic embryogenesis is a noteworthy developmental pathway that is highly comparable to that of zygotic embryos and it is an important pathway for producing somaclonal variants, developing artificial seeds, and synthesizing metabolites. Due to the single cell origin of non-zygotic embryos, they are preferred in several regeneration systems for micropropagation, ploidy manipulation, gene transfer, and synthetic seed production. Nonetheless, tissue regeneration via organogenesis has also proved to be advantageous for studying regulatory mechanisms of plant development. The tissue obtained from a plant to be cultured is called an explant. Based on work with certain plants, particularly tobacco, it has often been claimed that a totipotent explant can be taken from any part of a plant including portions of shoots, leaves, stems, flowers, roots and single, undifferentiated cells.,. However this is not true for all plants.In many species explants of various organs vary in their rates of growth and regeneration, while some do not grow at all. The choice of explant material also determines if the plantlets developed via tissue culture are haploid or diploid. Also the risk of microbial contamination is increased with inappropriate explants. The first method involving the meristems and induction of multiple shoots is the preferred method for the micropropagation industry since the risks of somaclonal variation (genetic variation induced in tissue culture) are minimal when compared to the other two methods. Somatic embryogenesis is a method that has the potential to be several times higher in multiplication rates and is amenable to handling in liquid culture systems like bioreactors. Some cultured tissues are slow in their growth. For them there would be two options: (i) Optimizing the culture medium; (ii) Culturing highly responsive tissues or varieties.Necrosis can spoil cultured tissues. Generally, plant varieties differ in susceptibility to tissue culture necrosis. Thus, by culturing highly responsive varieties (or tissues) it can be managed. Tissue cultured plants are clones. If the original mother plant used to produce the first explants is susceptible to a pathogen or environmental condition, the entire crop would be susceptible to the same problem. Conversely, any positive traits would remain within the line also. The commercial production of plants used as potting, landscape, and florist subjects, which uses meristem and shoot culture to produce large numbers of identical individuals. To conserve rare or endangered plant species. A plant breeder may use tissue culture to screen cells rather than plants for advantageous characters, e.g. herbicide resistance/tolerance. Large-scale growth of plant cells in liquid culture in bioreactors for production of valuable compounds, like plant-derived secondary metabolites and recombinant proteins used as biopharmaceuticals. To cross distantly related species by protoplast fusion and regeneration of the novel hybrid. To rapidly study the molecular basis for physiological, biochemical, and reproductive mechanisms in plants, for example in vitro selection for stress tolerant plants, and in vitro flowering studies. To cross-pollinate distantly related species and then tissue culture the resulting embryo which would otherwise normally die (Embryo Rescue). For chromosome doubling and induction of polyploidy, for example doubled haploids, tetraploids, and other forms of polyploids. This is usually achieved by application ofantimitotic agents such as colchicine or oryzalin. As a tissue for transformation, followed by either short-term testing of genetic constructs or regeneration of transgenic plants. Certain techniques such as meristem tip culture can be used to produce clean plant material from virused stock, such as potatoes and many species of soft fruit. Production of identical sterile hybrid species can be obtained. 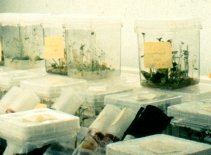 Although some growers and nurseries have their own labs for propagating plants by the technique of tissue culture, a number of independent laboratories provide custom propagation services. The plant tissue culture lists many commercial tissue culture labs. Since plant tissue culture is a very labour-intensive process, this would be an important factor in determining which plants would be commercially viable to propagate in a laboratory.